Good head enchants. It teases the eyes, inviting the curious to explore the unknown. The texture of head varies as much as the stars in the sky. Head can be rocky and voluminous, billowing up above the edge of the glass, or smooth and creamy, made of tightly knit bubbles. At times it may be loose and foamy. It can be as white as the snows on Mount Kilimanjaro, or as tawny and tan as the Girl from Ipanema. Guinness will leave a ring on the side of the glass for every sip you take. Many Belgian beers will do the same. Still other styles may leave intricate patterns of lace that curve like opera curtains over a brightly lit stage, or they may spot the glass like 101 Dalmatians. Some head dissipates to a veil or ring, and may die completely in the presence of the smallest molecule of natural oil in foods. In beer with high alcoholic content, head may be spare. Does it serve a purpose? What constitutes good head on beer? How does it form? Those who analyze beer insist that head is a necessary part of the beer experience. When served in glassware that has been properly cleaned and is of the correct shape, head will hold the delicate aromatics within the beer, and release them gently for your olfactory pleasure. Gases that live within bubbles that form the head will affect mouthfeel, creating sensations that differ on your tongue. When formed as a result of the natural carbon dioxide created by the action of yeast, bubbles will feel more tingly and effervescent than the creamy ones infused with a mix of carbon dioxide and nitrogen. Each style demands its own type of head, or rather, the proteins in barley or wheat malt, coupled with bittering hops, will determine the outcome of the head for each style. Beer foam forms by the action of carbon dioxide, or CO2, rising to the surface. It may be naturally produced by yeast during fermentation, or artificially produced by dissolving CO2 under pressure into the liquid. A nitrogen head – think “Guinness Stout” – is created by drawing beer from a keg using nitrogen or mixed gas (carbon dioxide and nitrogen), or by using a widget (in the canned version) or rocket widget (in bottled versions). Good head retention is when one-half of the height of the original head persists for at least one minute after pouring. The density of the head and its ability to last is, in large part, determined by the type of starch used. Proteins found in wheat malt, flaked barley, and flaked wheat are head boosters, but will not help if you are not already getting a fair amount of foam. Bittering acids in hops help foam to cling. Higher alcohols, or fusel oils, produced by fermentation temperatures that are too high or by the underpitching of wort, are head killers. 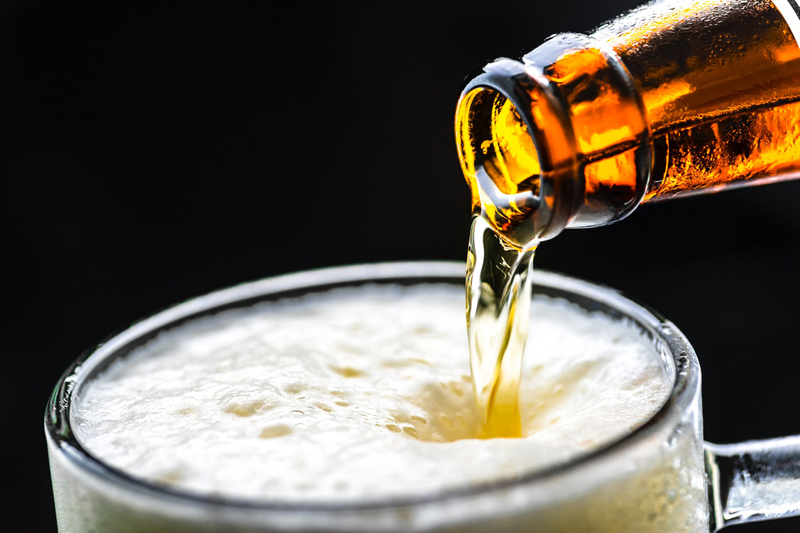 Residual oil, grease or detergents that remain on the surface of serving glasses, carboys, and other beer making equipment can kill a head also. Draught beer or, if you prefer spelling it “draft beer,” is defined as beer that is drawn from a cask or keg. Technically, these barrels are delivered to a pub with unfermented sugar and live yeast present in the unfinished beer, and will complete development in the cellar (cask conditioning). Proper fermentation can only take place at natural cellar temperatures. This cellar fermentation produces very light natural carbonation. Cask ale has a sweet malt character so fresh, you are reminded of yeasty bread that has been pulled from the oven. The natural temperatures allow the aromatics of the hops to fully blossom. It is pulled using a hand pump, or beer engine. A cylinder of carbon dioxide gas is not used in dispense; the cask is laid on its side and ale is “pulled” from the keg, using nothing but gravity. In an attempt to reproduce the joyous pleasures of draught beer, many beer companies have created their own versions of draught in bottles or cans. What does this really mean? In some cases, the beer may have been filtered to the point of sterility. This makes it unnecessary to undergo pasteurization, a process that, in the opinion of many beer drinkers, adds a cooked flavor and depletes the hoppy profile. In another interpretation of “draught,” beer is pasteurized, but creaminess is added to create a soft, gentle carbonation of small bubbles by introducing nitrogen in dispense. Guinness was the first to use this in their Draught Stout in Britain in 1961, in what Michael Jackson termed “fake hand pumps,” an adaptation that added nitrogen in the draught pressure system. This was so successful that Guinness wanted to find a way to introduce nitrogen to their canned beers, as well. By 1984-85, Alan Forage and William Byrne had begun the engineering of an “insert” to achieve this same creaminess for canned Guinness. This original design would result in poor head quality, but a modification of rapid inversion after the can was sealed - the brainchild of Tony Carey – led to success. The original widget employed a capsule with a nitrogen and stout blend that was filled on the canning line. Opening the can released pressure, and the capsule would “blow”, releasing the nitrogen, while the stout aided in diffusing the nitro gas. The result? Creamy, gentle carbonation, with additional protection against oxidation. Canned Draught Guinness was launched in 1988 as the first widget beer. In 1991, the widget won the Queen’s Award for Technological Achievement. Since that time, over 100 modifications on the original widget have been designed. Boddington’s Draught and Murphy’s Irish Stout use nitro in a capsule, but others like Beamish Stout, and Courage Ale, attempted to match this creamy texture by adding nitrogen in the canning line. Guinness now uses a “floating widget” in cans, a hollow sphere that is 3 cm in diameter. The can is pressurized by the addition of liquid nitrogen. Upon sealing, the nitro vaporizes and expands in volume, forcing gas and beer into the hollow sphere through a tiny hole. When the can is opened, the pressure in the can falls dramatically, causing the pressurized gas and beer inside the widget to vigorously expel from the hole into the surrounding beer. This causes tiny, nitrogen infused bubbles to form throughout the beer, and results in the smooth, creamy head that characterizes Guinness Stout. In 2001, Guinness introduced the “rocket widget” in bottles. It got its name from the rocket shape, complete with fins that serve to keep it upright in the bottle. Although the canned version uses liquid nitrogen, the bottled version uses gaseous nitrogen. Most of the pressurized gas is released from the bottom of the widget when the bottle is opened, although a small amount remains in the widget, releasing additional amounts into the beer as it is consumed. The beer head stays creamy to the last drop.